It’s the car that all other teams will benchmark themselves against during 2019 winter testing – but before heading to Barcelona, Mercedes’ W10 hit the track at Silverstone on Wednesday for its first shakedown run, with both Lewis Hamilton and Valtteri Bottas set to have a turn behind the wheel. Although the team have to abide by ‘promotional event’ rules to run the car, limiting them to just 100 kilometres on super-hard demonstration tyres, images from the private shakedown will give F1 fans a tantalising look at the car that, if the last five seasons are anything to go by, will be the one to beat in 2019. 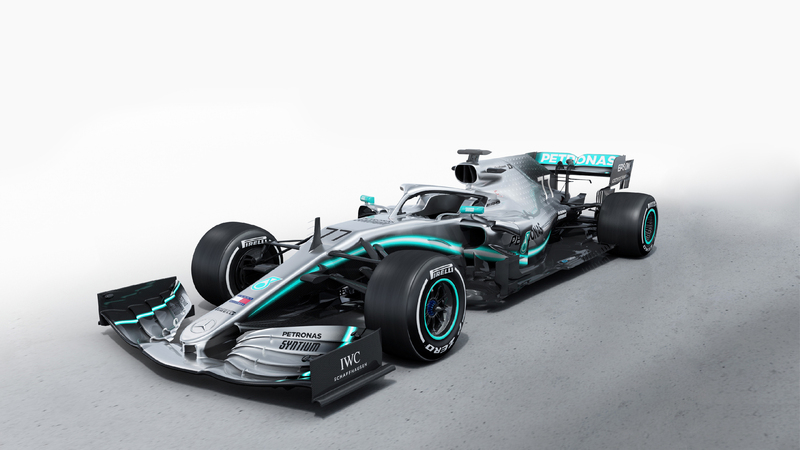 Before the W10 headed out on track at Silverstone, Mercedes released a series of digital images of the car they hope will carry them to a sixth successive victory in the constructors’ championship. Mercedes’ 2018 car, the W09, helped Lewis Hamilton to the fifth drivers’ title of his career – and his fourth with Mercedes – while in the hands of both Hamilton and Bottas, Mercedes secured their fifth straight constructors’ title, in the face of fierce competition from chief rivals Ferrari. But although the form book would appear to favour the Silver Arrows going into the new season, ahead of Barcelona testing, Mercedes Team Principal Toto Wolff sought to play down expectations – especially with a new set of aerodynamic regulations governing the design of the 2019 cars. “Five double championships is far more than we would have ever expected but every season starts with zero points.